In order to enable and promote a verification process that is abstracted from underlying verification engines, particularly a software simulator and a hardware emulator, modern testbenches should exhibit (from conception) a dual domain architecture with partitioned HVL and HDL module hierarchies targeted for the simulator and emulator, respectively, and linked together to run in unison. Fundamental to this architecture is the employment of BFM-proxy pairs to devise so-called split transactors, where components in the HVL domain typically implemented as classes act as proxies to BFMs implemented as interfaces or modules in the (synthesizable) HDL domain. An HVL proxy provides a surrogate or placeholder for the associated cross-domain HDL BFM to control access to it via a transaction-based HVL-HDL communication model using remote function and task calls. Effectively, the proxy embodies the transactor API to upper testbench layers, abstracting the cross-domain communication and the implementation details of the BFM's bus cycle state machines. The BFM-Proxy Pair Pattern is applicable in any situation demanding a common dual domain partitioned testbench architecture (i.e., separated HVL and HDL module hierarchies) for both simulation and emulation, and across verification engines in general. 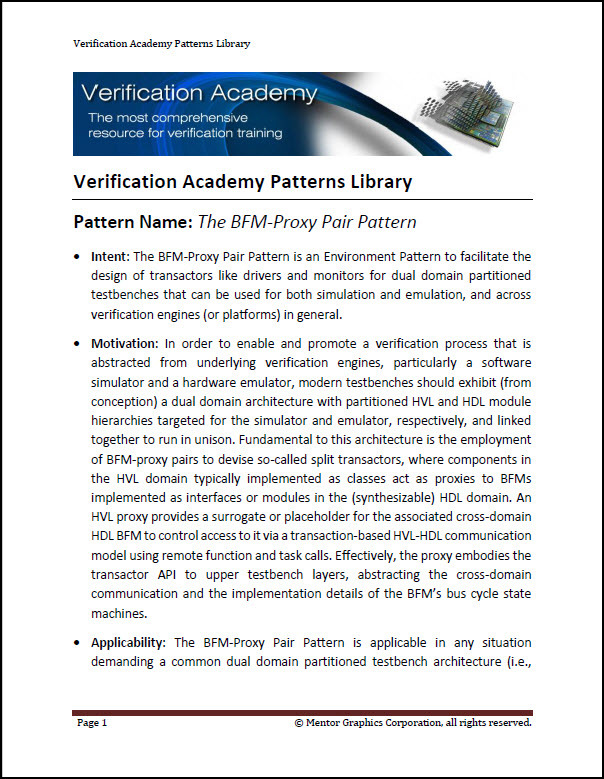 To view the entire BFM-Proxy Pair Pattern, please login with your Verification Academy Full Access account.